Citrine has been used in jewelry and embellishments for thousands of years. In ancient times it was often referred to as Chrysolitus, Greek for Golden Stone. 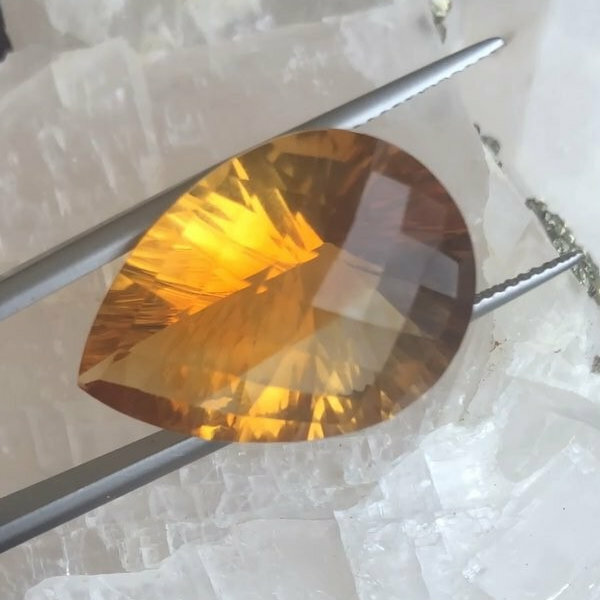 Because there was no way of differentiating gemstones except by color this name also pertains to other yellow gemstones used during the time period, Topaz and Beryl. During the Hellenistic period, 300-150 BC, Citrine was heavily used in jewelry and intaglios. It was believed to give the wearer the ability to predict the future and has been called the Merchants Stone because of its good luck. Found in Scotland in the 16 th Century, the Scottish Highlanders often used it to decorate knifes and kilt pins. Citrine was also a favorite of Queen Victoria who popularized it during the wonderful era of Victorian jewelry. The height of popularity for Citrine was reached during the 1930's and 1940's, where it adorned some of Hollywood's most popular leading ladies during the golden age of film. Some of the most fabulous Citrine can be seen in large art deco jewelry from that era. The name Citrine was first mentioned in the book, On the Nature of Minerals, published in 1556 and written by the father of modern mineralogy, George Bauer. It is derived from the French word for citrus, Citron. Citrine is definitely a bright and sunny gemstone as its name would suggest and has often been used to represent the sun. The ideal color range for Citrine is a medium yellow to reddish orange which is often referred to as Madeira Citrine. Citrine is the yellow color of the mineral Quartz and has a Mohs scale rating of 7. Naturally colored Citrine is extremely rare and the majority of Citrine on the market today is heat treated Amethyst or Smoky Quartz.